Keep stainless steel clean without harsh damaging chemicals. Simply dampen one side of the mitt with water to clean, and flip over to buff and polish with the dry side. Machine washable. Microfiber technology cleans and polishes stainless steel with just water. Comfortable fabric mitt is easy to use. Dampen one side for cleaning, then use the dry side to buff and polish. Just toss it in the wash after heavy use. We recently purchased 4 stainless steel kitchen appliances and I saw a magazine ad for this microfiber mitt. I was attracted by the fact that it cleans without chemicals. It works as advertised using only water and I highly recommend this product. I love this product. Lots of practical cleaning uses that I can use this around my home and car. A must have for those who like to maximally clean with minimal fuss. We have just purchased all newl stainless steel appliances. And finger spots drove me crazy. Within a week of getting our appliances and doing research on the Web about how to clean stainless steel with no chemicals , I found your simplehuman micro mitt. It had such amazing reviews that I decided to get one. Well I have to say I LOVE THIS MITT!! Its so easy and just use water. I have told many friends they have to get it. Great price too. Thank you for this great product. I purchased this mitt to use on all of my new Simple Human stainless steel products and I am thrilled with its performance. The finish on all Super Human stainless steel is beyond stellar as it is, and this mitt just compliments and puts the finishing touch on otherwise already great products! I own a residential remodeling company. At the end of every kitchen project, that includes stainless steal appliances, I give the client one of these mitts. It is a great non-toxic way of keeping finger prints at bay. I use one in my own kitchen too! Would recommend this product to anyone with stainless steel finishes. This mitt is awesome! I tried the mitt at a friends house. It was so easy to order on line and come in a snap. I use it on all my stainless steal appliances. My appliances no longer have fingerprints or water spots. Highly recommend this product and company. This little helper is awesome. I have finally found an instant stainless appliance cleaner that is "simple." The mitt is quick and easy to use on all my stainless steel appliances and the outdoor grill. No streaks and gets all the fingerprints and dog nose prints off the surfaces. Found out this product washes easily in the washing machine but shrinks in the dryer. Using the shrunk one on the outdoor grill. Wash it and hang it up to dry and it will last a long time. Wet one side and dry on the other! Works pretty well on stainless and doesn't leave any marks. My bin looked brand new afterwards. This is the only microfiber cloth that I use. Truly absorbent--no streaking. I use it everyday on the shower door and it's the only thing I use on mirrors--no more glass cleaners, just some tap water and this cloth. Durable (I wash it once a week in the machine and have had this for 3 years already.) I've probably bought six or so as gifts. Purchase was for the simplehuman "electric trash can." One of the best purchases I have ever made! After trying a variety of stainless products that were disappointing and expensive, I ordered this microfiber mitt. It works so effectively simply using soap and water and only takes a few minutes to do. Easy clean up in the washer. This is the only way to clean stainless. Have bought for friends. 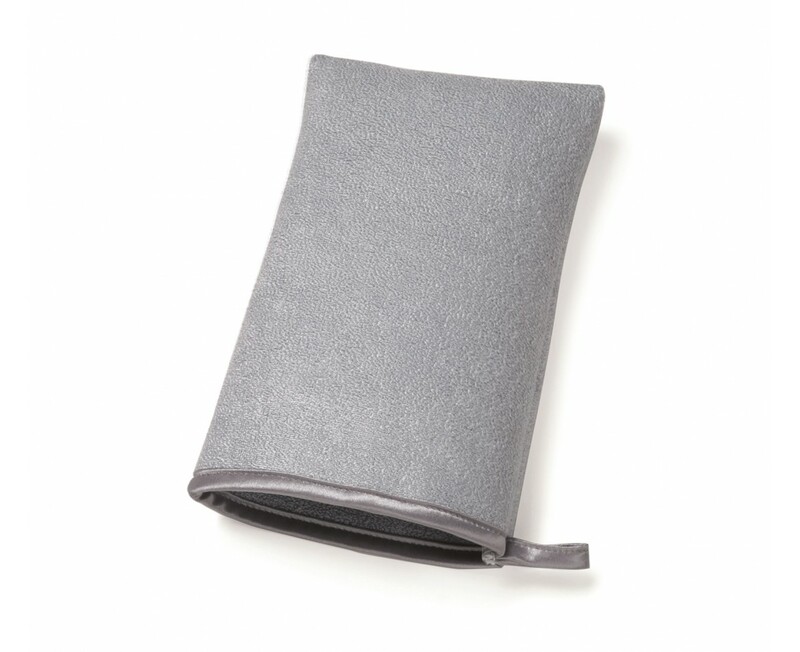 Perfect hand mitt for a quick clean up on any stainless steel product. I use it everyday. All it needs is a little water, and a quick wipe from both sides for a nice, dry, clean finish....no steaks. Glove is perfect for cleaning the can and other stainless. Does the job it says without any bother at all. Polishes all your steelwork without too much effort!! What more do you want! It is so simple to use and effective. I use it almost daily. It fits your hand well and seems quite durable. It looks nice. I bought this mitt to clean our stainless steel finished kitchen appliances. Our refrigerator in particular collects fingerprints like crazy and is almost impossible to keep clean and presentable. This mitt does a great job with just plain water or maybe a little Windex. One side to wipe and the second side to dry and the drips and fingerprints are gone! Easily hung from a hook, easily fits hand, quickly absorbs liquid and shines up stainless steel fixtures. Unfortunately, spotty discolorations remain after use, but don't interfere w/function. Like everything about it; nothing works as well. Bed bath and. Beyond stopped carrying them - panicked until I found them on line. I was amazed at the efficacy of this product - it really performs well. And, it worked exactly as described which shocked me even more. If you have stainless steel appliances you need this mitt! I tried to use this on appliances that had not been cleaned for quite awhile. I don't think it was a fair test - the item did not do a good job, and it took stainless steel cleaner used with it to get the job done. I'm hopeful that now that I've done a thorough cleaning this mitt will be more useful. I own a house cleaning company and we are always looking for products that will help us reduce our carbon footprint. Finding reusable products while reducing our chemical cleaners is always a concern. This product doesn't need any cleaners; only hot water and some elbow grease. It removes the gunk, finger prints and streaks on stainless steel almost effortlessly. Microfibre mitt is very well made looks and feels good it does a good job with only water so saves money when cleaning, i'm very happy with it and recommend it highly. What a Work Horse on Stainless Steel! This microfiber mitt is the greatest cleaning tool if you have lots of stainless steel in your kitchen. I purchased it when we were updating our kitchen, knowing that we would be going to all stainless steel appliances. I was a skeptic, at first, that anything could clean with just plain water. I was proven quite wrong, happily, and I LOVE this mitt! I use it every day to clean the fronts of all my appliances, and then just toss it in the wash to clean it. I have multiple chemical sensitivities, so the idea of cleaning with water only is perfect for me. My husband is a stickler for streaks, especially on the fridge, since it is the largest stainless surface in the kitchen. I was forever trying to wipe at just the right angle to make it look good. With this, it is one wipe, no streaks and I am done. It is awesome. The mitt is the only thing that works on my new ss appliances. It is so good, I ordered two more as gift for my sister and niece to use on their new ss appliances. Works great, does everything it's supposed to. Save your money. A damp paper towel with or without a surface cleaner will work equally as well. Does good duty against all of the little fingerprints on our stainless kitchen appliances. Good, convenient way to handle quick cleanup when in a hurry. I've purchased many wonderful things from simplehuman but this cleaning mitt is not one of them...I purchased two mitts because we have a lot of stainless steel to clean and have tried both of them with the same result, and that is that they just are not able to effectively clean the stainless steel surface. I get better results from using a sponge and dry towel then using these mitts. Thanks for your feedback of this product. We've tested the mitt on various types of stainless steel and found that it does outperform other standard cleaning methods, and is also more environmentally friendly. Our customer service team has contacted you to further identify the problem. This works great on stainless steel appliances. I use a water/vinegar/dish soap combo on this cloth on one side and wipe streak free with the other. This works better than any commercial product I have tried for stainless steel. . This little sponge mitt from Simplehuman for cleaning stainless appliances is, quite simply, just perfect. All of my appliances, everything from the big fridge to the small soap dispenser, shine easily every day. No worry about elbow grease or streak freak. The mitt fits well into big hands or small and a simple wash (don't use fabric softener) makes it just like new! I love it so much, I wish that I needed more than one. used it once and now it's collecting dust, seemed to work decently. all in all, not really doing it for me. I have been searching for the perfect trash can for a long time. I'd buy something, think it was perfect then over time, toss that out with the trash and start looking all over again. The big thing is cleanliness and containing the smell of garbage...With other trash cans, I'd scrub and scrub and could not get the smell out plastic or otherwise. Finally, I've found nirvana! Really, the Simple Human trash can is nice to look at, easy to clean. I have the medium size trash semi-circular shaped trash can. It doesn't draw attention to itself...it works perfectly for us. The Simple Human trash bags work equally perfect. A weeks worth of trash fit more neatly in our 30 gallon bin so on trash pick-up day they're not popping the cover like before. I also purchased the kitchen soap dispenser...another great product. I wish all things in life were as simple! Thank you! Makes cleaning stainless steel a breeze! Love this little mitt ... easy to use when you need to do clean your stainless steel appliances in a hurry. No chemicals needed when cleaning stainless steel, granite or other counter tops. Just water on one side, dry with other, or even better, use two mitts, one moist, one dry. I wasn't sure about this mitt being everything it advertised to be, but to my amazement it was even better than the product info mentioned. It took 3 or so times to really get my stove and dishwasher front panels as streak free and clean as I wanted, but after that I only need to use it lightly and both my appliances shine beautifully!!!! This is a must by product. Just follow the directions and it does a great job. I couldn't believe how well this mitt cleaned my stainless steel appliances. No smears or smudges. Super product. It really does work! It easily cleans and shines stainless steel & chrome. Was finally able to actually clean my computer flat screen monitor too. I will be ordering more to use myself as well as gifts to friends. I ordered this mitt on top of a larger order just to try it out. It's not terrible but if I'm working on my stainless steel sink or pots I'd rather just take some steel wool. Also the mitt soaks all the way through (no inner liner to keep your hand dry) so just beware of that. It's not bad at all for light duty. I like not having to use chemicals to make my stainless steel look very clean. I especially like how it cleans the handles on my stainless steel fridge. Great product!